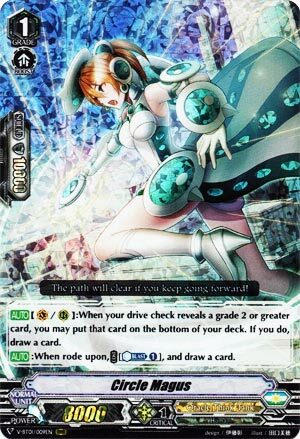 [AUTO](VC/RC):When your drive check reveals a grade 2 or greater card, you may put that card on the bottom of your deck. If you do, draw a card. [AUTO]:When rode upon, COST [Counter Blast (1)], and draw a card. So I guess this is how OTT is going to equal Berserk Dragon in terms of not-minusing as you ride up. It’s the first skill you want, as you gain a free-card unconditionally should you ride her first and then hit Grade 2. As a RG, she’s okay. She doesn’t make extra numbers but at least it can strengthen hand for guarding should you need to, which is primarily what you’ll be using her for, sacrificing a higher-Grade card for something with bigger shield. 4-of. You want this on Turn 1 and if nothing else you’re not losing anything as a rear-guard.